Open Project signs the first Faiza Bouguessa’s boutique in Dubai. 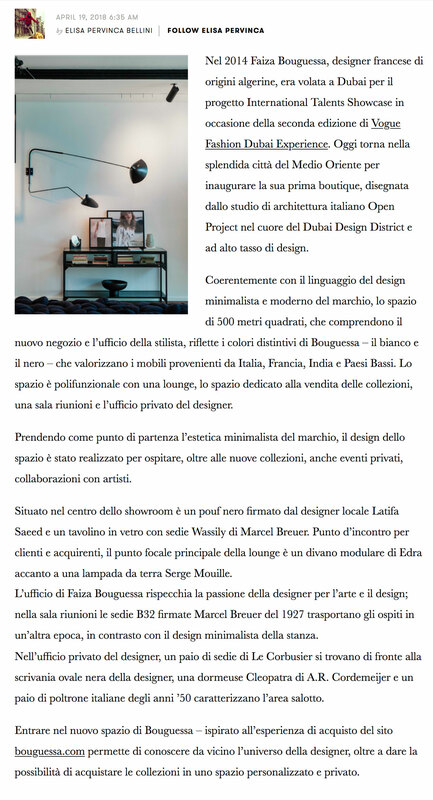 “The space is 500 square metres, which include the showroom and the designer’s office, and reflects Bouguessa’s distinctive colors – black and white – which enhance italian, french, indian and dutch furniture. The area is multifunctional with a lounge room, the selling area, a meeting room and the designer’s private office. The interior design is inspired by the minimalistic aesthetic of the brand and is realized to host, beyond the new collection, also private events and collaborations with artists.